Our ongoing quest for awesome Bordeaux brings this Saint-Estephe for immediate enjoyment! On Sale! Our ongoing quest for awesome, great drinking, super value Bordeaux has paid off once again. 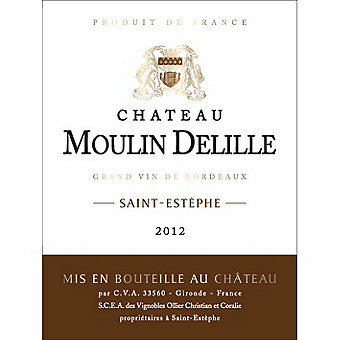 Chateau Moulin Delille is located at Leyssac in the heart of the Saint-Estephe wine appellation, home to outstanding Classified Growth Bordeaux. The estate comprises some 60 acres of vineyard on clay/ gravel soils planted with 45% Merlot and 55% Cabernet Sauvignon. The estate is owned by the fifth generation of the Ollier family and is currently managed by Christian Ollier and his daughter. Chateau Moulin Delille is made using traditional techniques with fermentation in cement tanks and aging in oak barrels for 12 to 18 months. This 2012 is a blend of 70% Merlot and 30% Cabernet Sauvignon is at an ideal peak of drinkability and enjoyment. Years of bottle age resting in the Chateau cellars have created a silky textured beauty. The palate is a complex melange of sweet berry, earth, truffle, cedar, leather and roasted coffee flavors lifted by fine acidity and lengthened by the velvety soft tannins. 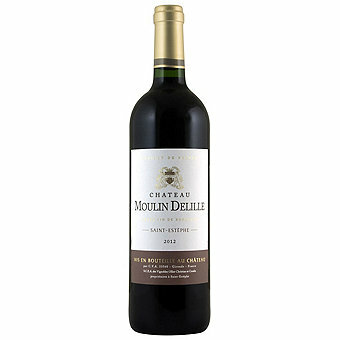 We’re offering this one-of-kind Bordeaux to our Wine Express customers at very special reduced price so, Don’t Miss It!